A tourbillon, "whirlwind" in French, a type of mechanical clock or watch escapement, was invented in 1795 by Abraham-Louis Breguet. It is designed to counter the effects of gravity and other perturbing forces on the balance wheel, the balance spring and the escapement that can affect the accuracy of a chronometer. 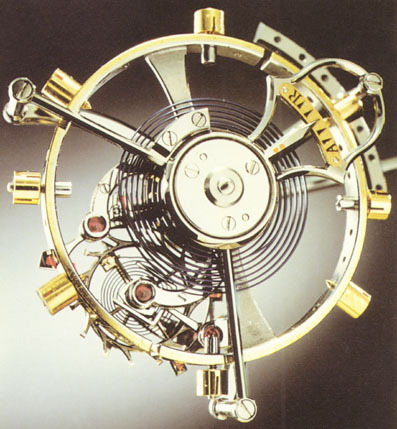 This is accomplished by mounting the escapement in a rotating frame, so that the effect of gravity cancels out when the escapement is rotated 180°. The effects of gravity were particularly problematic when pocketwatches were carried in the same position for most of the day. 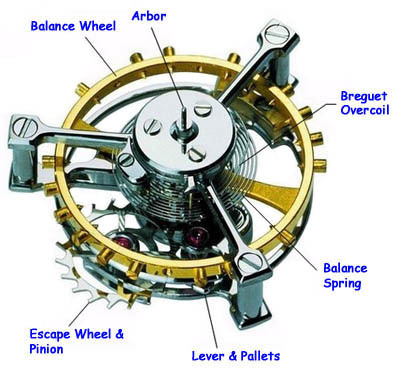 In a tourbillon, the entire escapement assembly rotates, including balance wheel, escape wheel, and pallet fork (anchor). The rate of rotation varies per design but has generally become standardized at one rotation per minute. The tourbillon is considered to be one of the most challenging of watch mechanisms to make and is valued for its engineering and design principles. In modern watch designs, a tourbillon is not required to produce a highly accurate timepiece because wristwatches are by nature in a constantly changing position when worn. Nevertheless, the tourbillon is one of the most valued complications of collector's watches and premium timepieces. 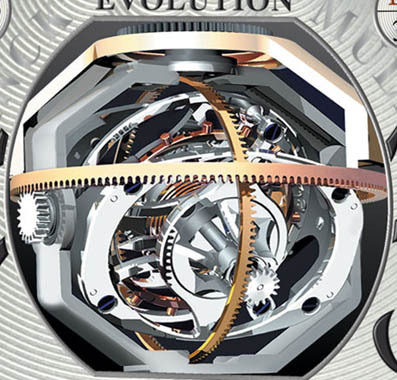 In fact, modern implementations typically allow the tourbillon to be seen through a window in the watch face. In addition to enhancing the charm of the piece, the tourbillon acts as a second hand as it rotates once per minute. This animation shows the first 10 seconds of the Tourbillon operation. In fact, the yellow arrow ( second hand ) will complete a full circle in 60 seconds. This animation shows the first 10 seconds of the CARROUSEL operation. In fact, the balance wheel and second hand will complete a full circle in 60 seconds. Pay Attention to the White Dot ... The end-to-end position is changing ! But the Axial of the Balance Wheel is unchanged. The true name of this escapement is called Carrousel which was invented by Bahne Bönniksen in 1892; however, most people call it Tourbillon nowadays. In the late 20th century, the first research into multi-axis tourbillon movements was done by British clockmakers Anthony Randall and Richard Good, eventually producing 2 - and 3 - axis tourbillon movements.